Greenland Is Still Burning, But The Smoke May Be The Real Problem : The Two-Way Wildfires are still burning in western Greenland, close to the Arctic island's ice sheet. As the fires burn, they release black particles that can coat the ice and snow, and make it melt more quickly. The wind direction from the fire in western Greenland has largely blown smoke toward the island's ice sheet and away from communities. More than two weeks after they were first spotted, wildfires on the western coast of Greenland are still burning, worrying local residents and drawing the attention of scientists. 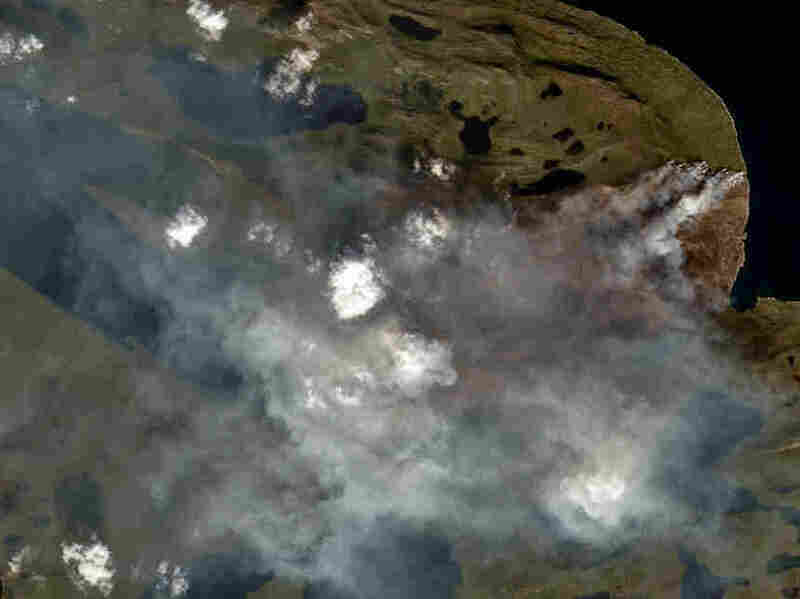 The fires are roughly 90 miles northeast of the second-largest Greenlandic town, Sisimiut, as we previously reported. There are currently three growing hot spots, according to an analysis of NASA data by Stef Lhermitte, an assistant professor of geoscience and remote sensing at Delft University of Technology in the Netherlands. Nina-Vivi Andersen, a reporter for Nanoq News in the capital, Nuuk, has lived in Greenland her whole life and says she has never heard of a wildfire there. "It's very unusual," she says, and the timing is particularly bad because reindeer hunting season just opened on Aug. 1. Satellite data suggests that a campfire or a cigarette likely started the fires. "We have been talking with hunters and stuff like that, and they are very sad about the wildfire," she says. The hunters' concerns have prompted a minor firefighting effort by one of the two regional governments in the area of the blazes. Andersen says the government in Qaasuitsup municipality, which includes the World Heritage Site town of Ilulissat, has sent about 15 firefighters to assess the fires and see what might be done to protect the reindeer territory. The wind direction has largely blown smoke toward the island's ice sheet and away from communities, including the international airport at Kangerlussuaq, where travelers said they could smell the smoke last week. But while the wind direction is good news in the short term, it may spell danger in the long term, says Jessica McCarty, an assistant professor of geography at Miami University in Ohio. "The [thing] that I'm concerned about for Greenland is the black carbon," she says, "You can think of it as the part of smoke that's black. The soot. And when black carbon deposits on ice — something that's very dark in color on something that's very white — that then speeds up the melting of the Greenland ice sheet." Melting ice drives sea level rise and is one way wildfires near glaciers can exacerbate the effects of climate change. McCarty has been studying satellite and other data about the Greenland fires for weeks now and notes that the area appears to be home to mostly low vegetation like moss on rocks, with no trees or tall grasses. She says all signs point to this being a peat fire. "[Peat] is a good fuel source," she explains. "It's essentially like the peat logs you buy for fire pits or for fireplaces." When peat burns, the flames don't run across the landscape quickly the way they do in grass or forest fires. Instead, peat fires smolder down into the ground, so the boundaries change more slowly and they can burn for a very long time. Some peat fires have been known to persist through winter months, smoldering away under the snow. Peat fires also release a lot of greenhouse gasses. "Peat is basically pure carbon. So, yes, when it burns it releases a lot of CO2," says McCarty. As for whether these rare Greenland fires are being caused by climate change, McCarty says it probably contributes, but she needs to study it more. "The Earth is complex. Our climate system is complex. Rarely can we say it's one thing that caused this. But in this example, we do know that it was not expected for the permafrost to be at this condition so soon," she says. Permafrost is perennially frozen soil. Climate models had predicted that it would take until 2050 for the permafrost to melt as much as these fires suggest it has. McCarty and other scientists say they're reviewing decades of satellite data about Greenland — studying fire patterns in one of the last places they expected to.